Mount Etna is an active stratovolcano on the east coast of Sicily, Italy. With a height of currently 3,329 meters / 10,922 ft (this varies with summit eruptions), it is the highest active volcano in Europe outside the Caucasus, and also the highest peak in Italy south of the Alps. To date, the Giro d’Italia has visited the volcano four times, three times to the Rifugio Sapienza and once to Piano Bottaro lower down. The last visit was in 2017, where Jan Polanc, the Slovenian rider of UAE Team Emirates won stage 4, as the last survivor of a four-man breakaway. The fifth visit will be in 2018 edition. The Giro d’Italia visited Mount Etna four times in history, in 1967, 1989, 2011 and 2017 editions. In 2018, the Italian Grand Tour will visit the volcano for the fifth times. Stage 6, on May 10, a 163 km going from Caltanissetta to Mount Etna, will also be the first mountaintop finish of the Giro d’Italia 2018. Friday, May 26. Stage seven, ending atop Mount Etna, broke the peloton into bits for the first time in this edition. Climbing and sprinting ace Franco Bitossi (Filotex) was first to the top of the volcano. Coming in about 20 seconds later, Gianni Motta (Molteni) was the first of the contenders, followed by Eddy Merckx (Peugeot), Felice Gimondi (Salvarani), Italo Zilioli (Salvarani), José Pérez-Francés (KAS), Vittorio Adorni (Salamini-Luxor) and Roger Pingeon (Peugeot-BP-Michelin). Jacques Anquetil (Bic), Rudi Altig (Molteni) and Franco Balmamion (Molteni) were a further twenty seconds back. Michele Dancelli (Vittadello) remained in pink for another day. Felice Gimondi won the 1967 Giro d’Italia. Monday, May 22. 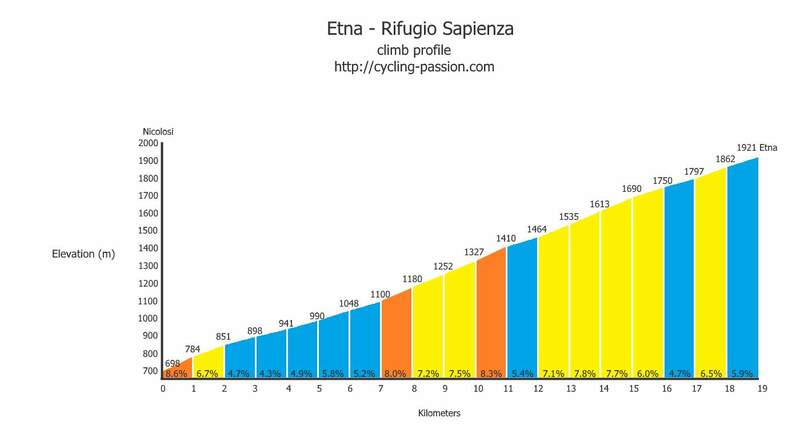 Mount Etna has been climbed very early in the race, just in the 2nd stage. Acacio Da Silva (Carrera) won the stage. Laurent Fignon (Super U-Raleigh) won this edition of the Italian grand tour. Sunday, May 15. Alberto Contador (Saxo Bank) took the stage and the maglia rosa. He attacked at 6.7 km remaining in the 169 km stage, over the slopes of Mount Etna. He eventually put 50 seconds into his rivals by the summit finish atop one of the world’s most active volcanoes. Contador would carry the pink jersey to Milan and win the 2011 Giro. But, later, his results were annulled. 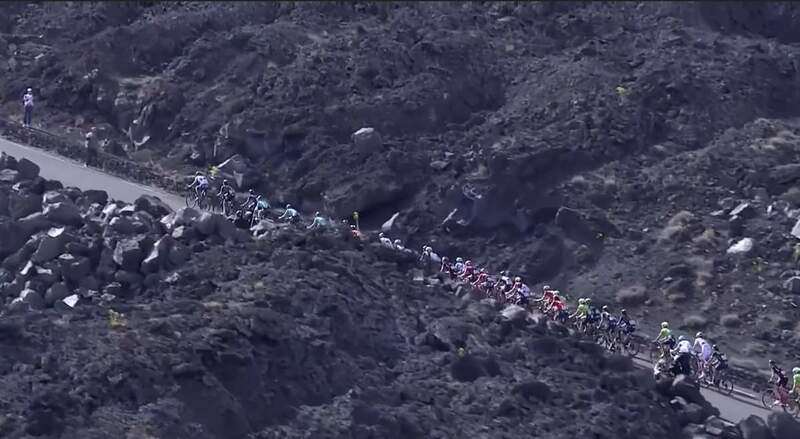 The peloton (or what remains from it) climbing Mount Etna during stage 4 of Giro d’Italia 2107. Tuesday, May 9. Jan Polanc, the Slovenian rider of UAE Team Emirates won the stage. He was in a four-men breakaway all time. On Mount Etna, he managed to survive and didn’t get caught by the general classification contenders.